EON Productions, Metro-Goldwyn-Mayer Studios and Sony Pictures Entertainment announced today that Skyfall earned £37.2 million ($59.9M) in its opening week in the UK, overtaking Harry Potter and the Deathly Hallows – Part 2 (£35.7 million/$57.6 million) to secure the biggest 7-day gross of all time in UK box office history. The film also passed the $100 million mark globally on Thursday. 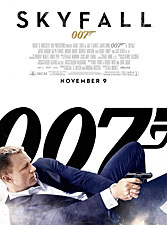 Skyfall opens in North American IMAX theaters on Thursday, Nov. 8 and in conventional theaters on Nov. 9.